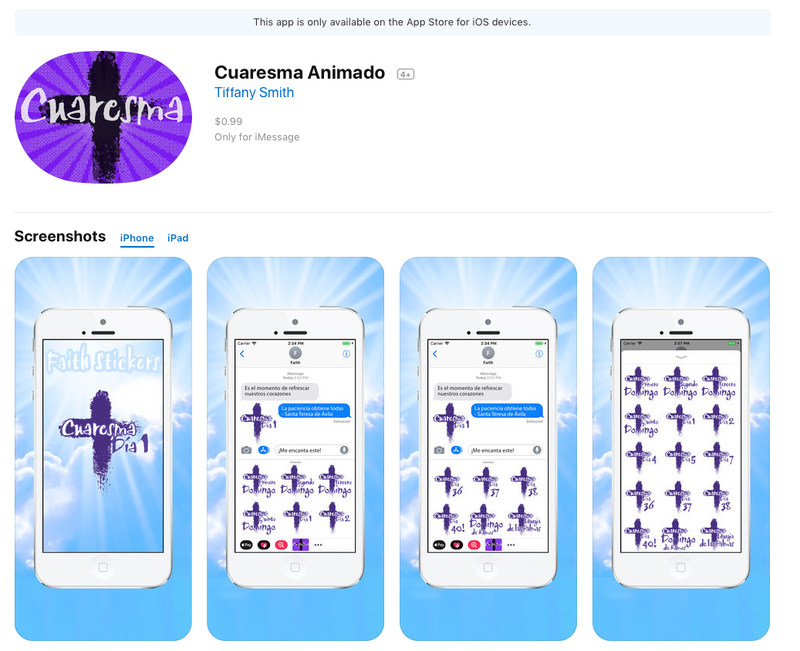 Just launched for the Lenten season: Faith Stickers for your iPhone or iPad. These one of a kind Stickers add a special touch to your text messages sent to friends or family, and with your spiritual brothers and sisters around the world, during this most important time of the faith year. The sticker packs help visualize the prayer’s we send to others and can be used to invoke our heavenly souls to pray for us, encourage others in times of need, invoke the saints in our prayers, ask for intercession, and celebrate important days of the liturgical year. 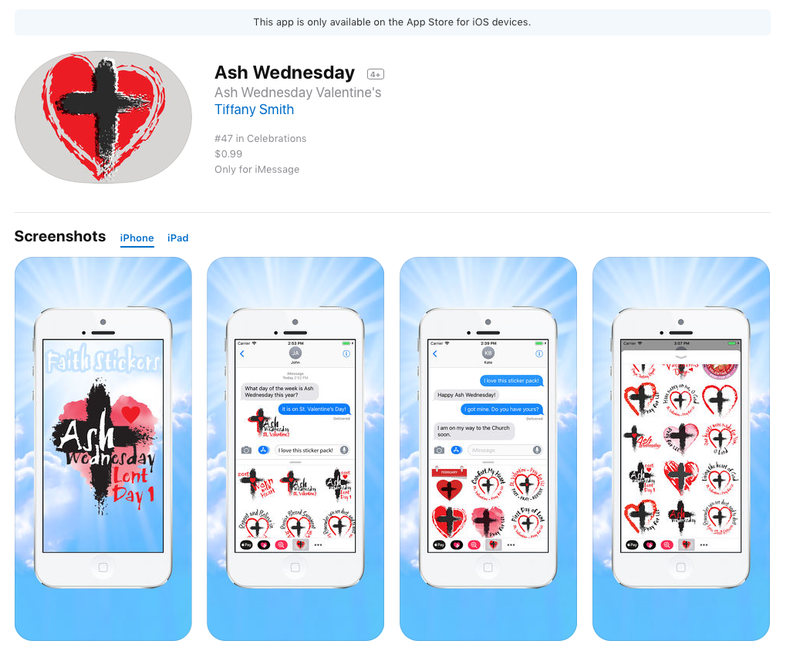 Launching in time for one of the most holy days of the Catholic liturgical year, Faith Stickers allow iPhone and iPad users to express prayerful messages in a whole new way. 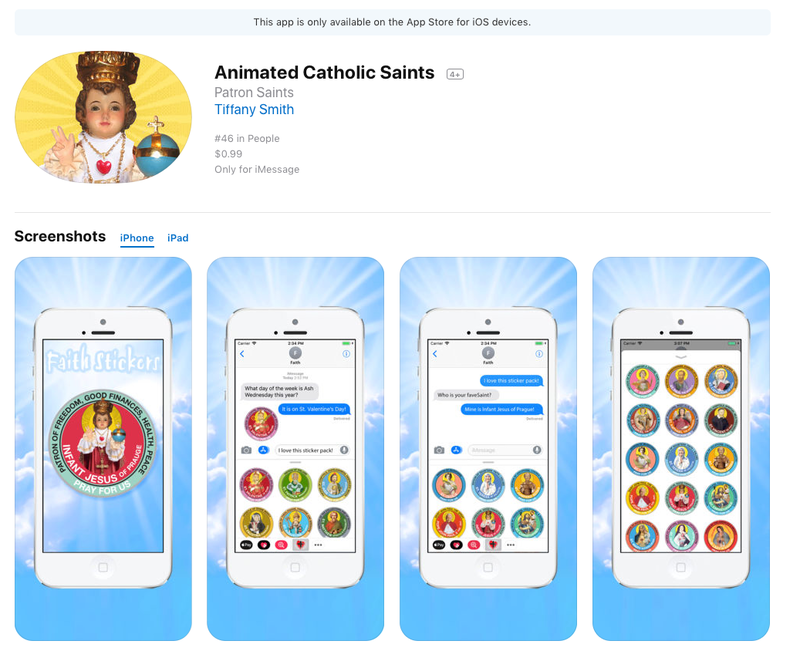 Four sticker packs, now available in the App Store, feature over 120 different faith-based stickers—some animated—and bring extra faith back into people’s lives through their daily communications. One sticker pack includes over 30 Patron Saints while the other features 40 inspirational messages focusing on the Catholic season of Lent. Another sticker pack provides a countdown of the 40 days of Lent, and the fourth includes words of encouragement during the time of Lenten season. The three Lent packs are also available in Spanish. Each sticker pack is available for 99 cents and can be downloaded from the App store on any iPhone or iPad. It’s as simple as tapping the sticker to place in the message field of a text, just as you would for an emoji. Stickers can also be layered with photos, scaled, and rotated to create custom images. Faith Stickers allow all to go forth and be a missionary in even the simplest of ways – through text messaging and online communications. The sticker packs help visualize the prayer’s we send to others and can be used to invoke our heavenly souls to pray for us, encourage others in times of need, invoke the saints in our prayers, ask for intercession, and celebrate important days of the liturgical year. Faith Stickers also provide an age-appropriate way for young children to express themselves prayerfully to each other. Faith Stickers donates a percentage of all proceeds to various faith-based and charitable organizations. Additional sticker packs from Faith Stickers will be launched and available in the App store soon. For more information, contact Faith Stickers at press(at)faithstickers(dot)com or visit http://www.faithstickers.com. Faith Stickers is a digital way to express and share the Gospel message, in the simplest of ways – through text messaging and online communications. Faith Stickers provides on-going faith-based and saint-inspired artwork to help spread God's word to all. Faith Stickers A percentage of all profits will be donated to various faith-based and charitable organizations. http://www.faithstickers.com.